How Is Built The Ionian #5 Mode? 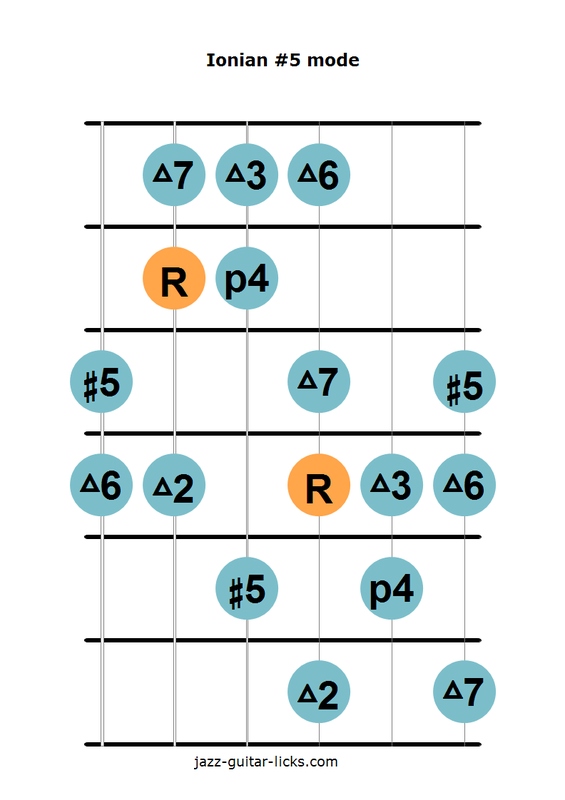 The Ionian #5 mode is the third mode of the harmonic minor scale, this is a major scale. It has seven notes just like the Ionian mode (major scale) but with an augmented fifth instead of a perfect fifth. The formula is 1 - 2 - 3 - 4 - #5 - 6 - 7. 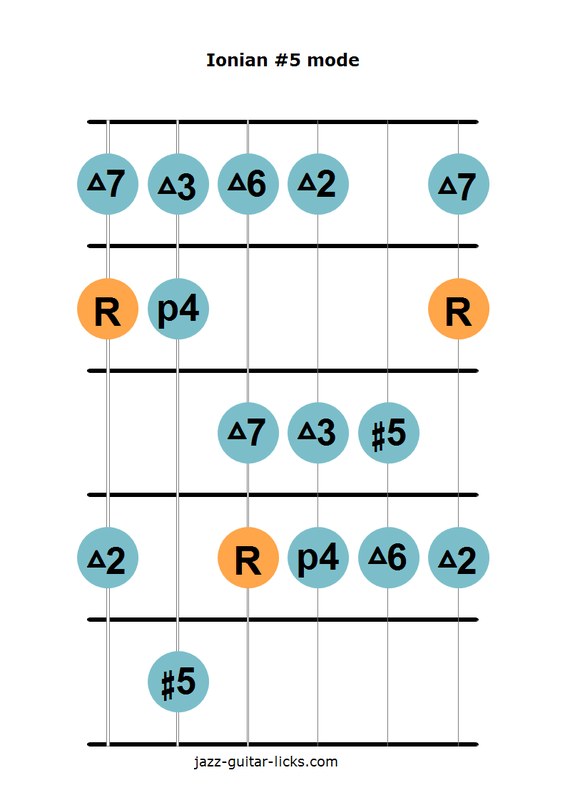 The Ionian #5 mode is generally played over maj7#5 chords. Although these chords are uncommon, they can be used as a substitute for Ionian chord types when you want to add a little bit of tension. Please note that the Ionian #5 mode provides a typical interval, the 1-1/2 step distance found in all the modes of the harmonic minor family. How To Play The Ionian #5 Scale On The Guitar? 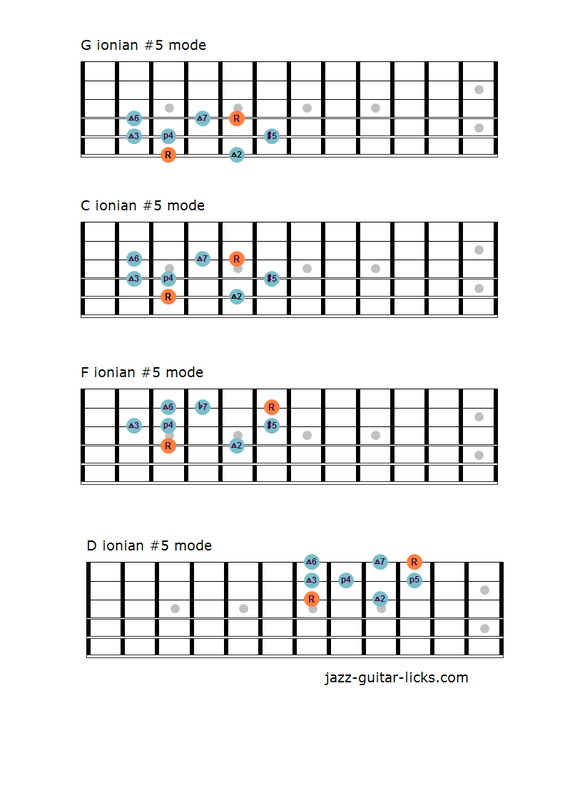 These 2 diagrams show you how to play the Ionian #5 mode on the guitar. Here are five Ionian #5 mode one-octave shapes. The first diagram represents the G Ionian #5 mode with the root on the sixth and fourth strings. The second shape is the C Ionian #5 mode with roots on the fifth and third strings. The third is the F Ionian #5 mode with roots on the fourth and second strings and the last one is the D Ionian #5 scale with roots on the third and first strings. You must be able to transpose and play theses shapes in the twelve keys.